Ages 8 through 17. 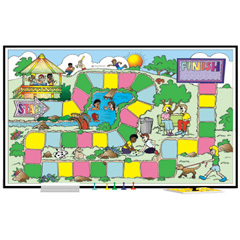 This game is designed to strengthen pragmatic communication and problem-solving skills. As children play the game, they are asked to distinguish appropriate from inappropriate behaviors, to evaluate the responses of others, and to suggest alternative solutions. Skills emphasized include solving problems, making requests, giving polite responses, reacting to rude behavior, convincing others, stating viewpoints, resisting peer pressure, sharing feelings, dealing with anger, responding in a socially appropriate manner, and showing sensitivity to others. The kit includes a colorful hardback playing board, game cards, playing instructions, and a spinner. This game and all other games published by Academic Communication Associates was manufactured in the United States of America.